Almost every year I tell myself that I will NOT do any last minute knitting for gifts. And almost every year I get last minute inspiration from something I've seen or read. This year is no different. For me this year it is cowls. 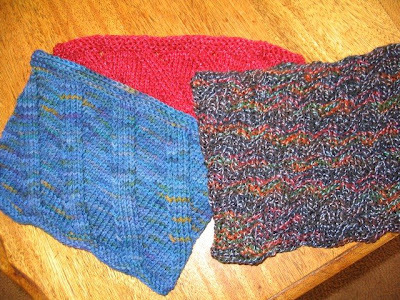 I like wearing them; I like knitting them and I hope my gift recipients will like them too. I am on Ravelry and I found patterns that would work with my favorite Mountain Colors Yarns. A cowl needs to be made with something soft and not scratchy so I chose Twizzle for my Darkside Cowl (this link may only work if you are a member of Ravelry) knit in Sapphire Trail; I chose 4/8's Wool in Alpine for one Birthday Cowl and Rich Red for the second one. I am thinking of knitting a fourth cowl also in Rich Red as it's such a festive color. If you need a quick gift idea a skein of Twizzle or a skein of 4/8's Wool would be enough to make at least 2 cowls. I haven't knit three with one color so I don't know for sure if that would work. So get those needles out, start scanning the internet for patterns and start knitting with your favorite Mountain Colors Yarn! How about River Twist? I just knit my son a vest and I absolutely love that yarn!!! Way to go! I'll blog the finished product soon!